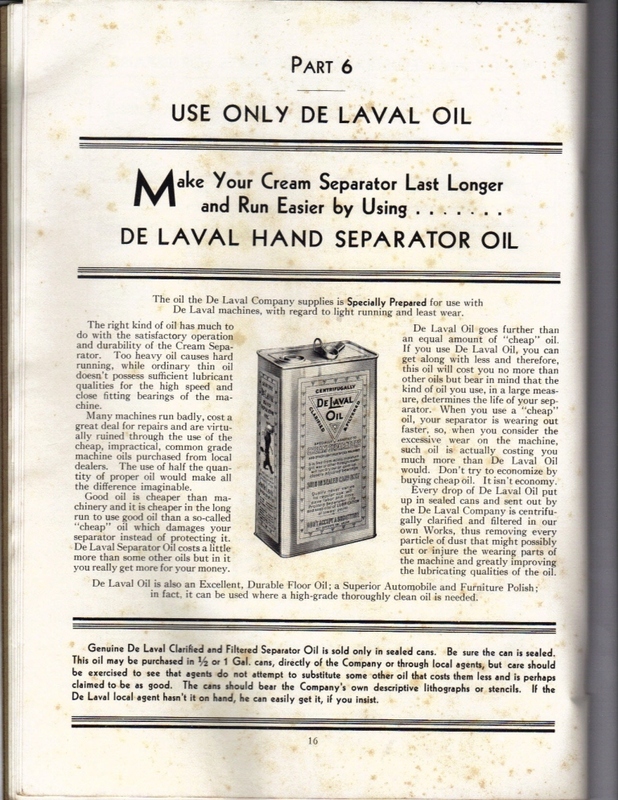 Can anyone suggest what type of oil I should use in a De Laval jr. #5? 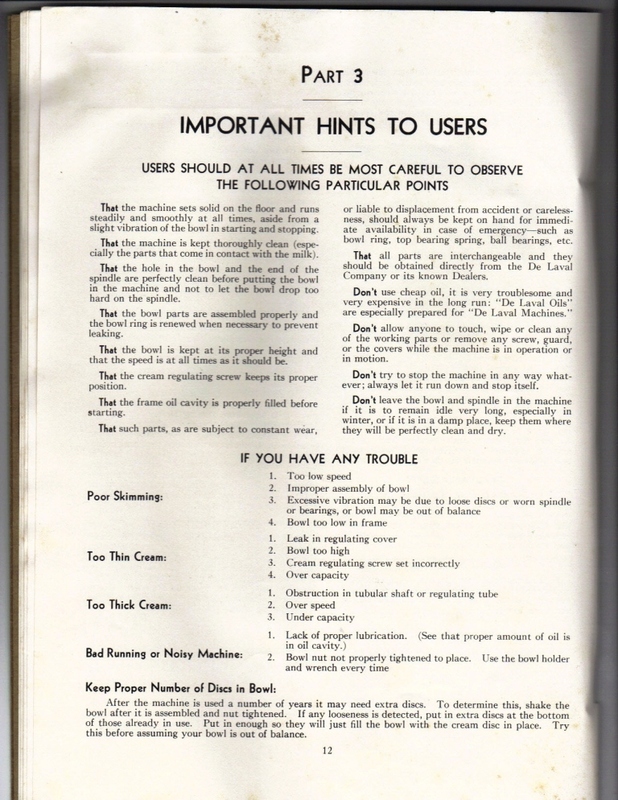 Thanks for the manual. 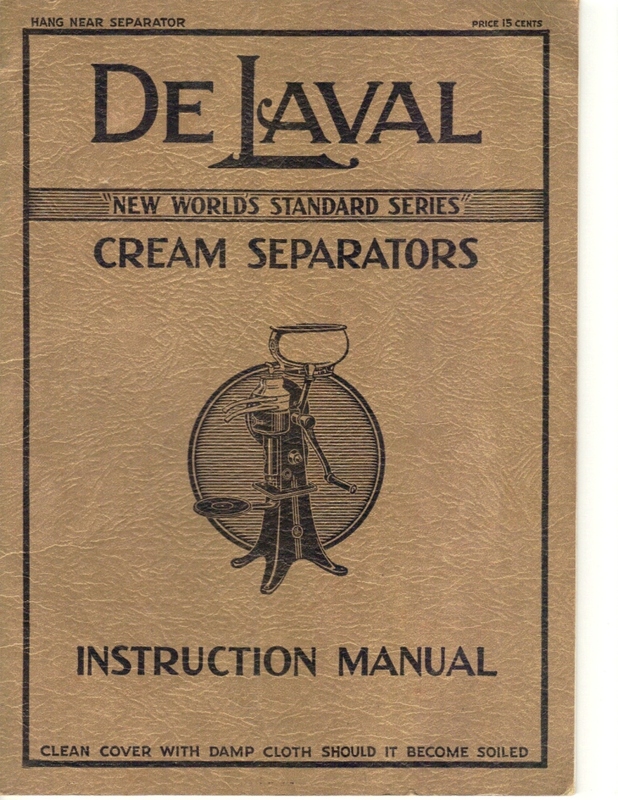 My husband just found a DeLaval s-12. It looks very similar to the one you show. I cant wait to have it up and running. Got back to work on the separator . Clean it up, oil everything got it to move works great now. NOW was wondering how can I tell how old it is. 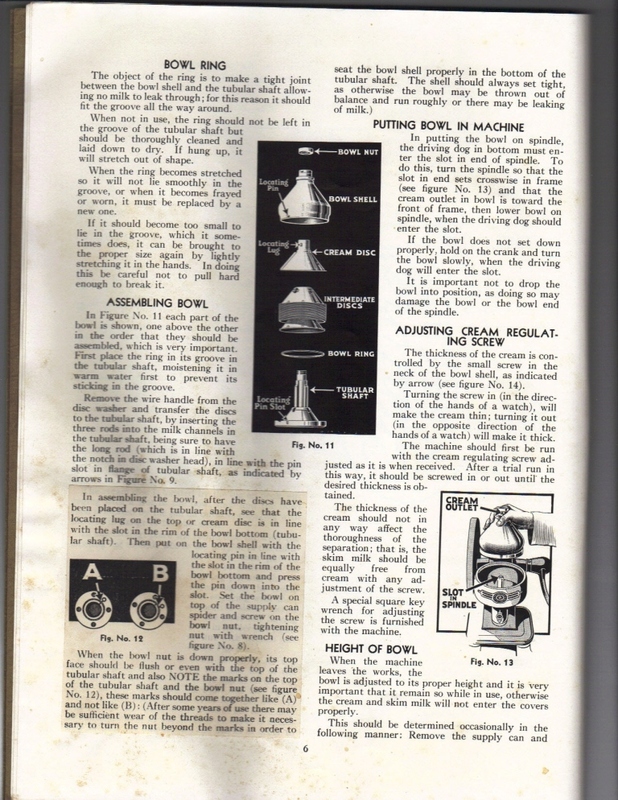 looking for the rubber seal ring in bottom of the milk disk case also where to get the oil-love to have the manual is there one for sale? Thank you so much for posting this! I finally found all the pieces for the delaval #16 at my parents house. Very excited to get it cleaned up and working again this manual will be a huge help. getting back to you. Cant move the handle at all seems like it is seized up. Might have to take it to a machine shop to see what is not working. OIl could be low. 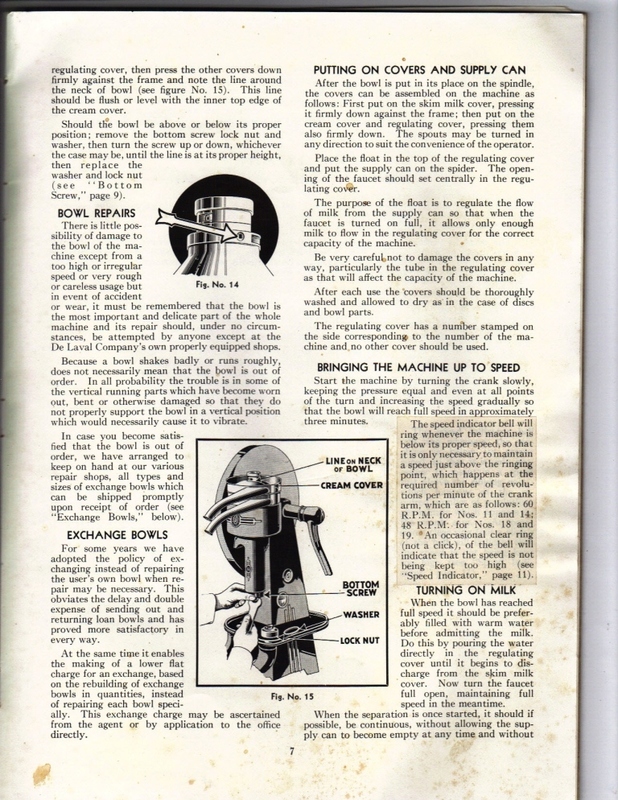 Now for the cones and spinning parts are you talking about the bowl parts . If so they were not on. Any other ideas why its not letting me to spin the handle. 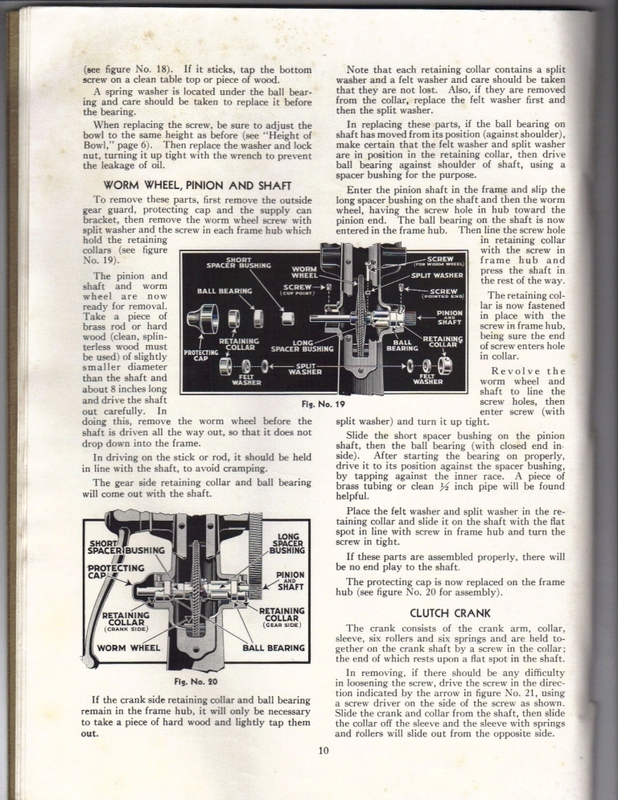 The gears are fairly stiff, are you putting some weight into it when turning? Will it go backwards (should spin easily counter-clockwise). My only other thought would be to open it up and see if a gear has seized for some reason. Cant get the handle to turn, it did when I bought it but not now. Check the oil level, if yours is one that takes oil. It may have leaked out during the move. Also double check that the cones and spinning parts are all set in place properly. If they are not, it could cause the handle to seize. There is a whole stack of disks (what I would call intermediate disks) but my understanding is that on the top of that stack should be one “special” disk which the owner’s manual called a “cream disk” . It appears to be the same set-up as on my cheap, plastic, made in the Ukraine cream separator. Does this cream separator not have a special “cream disk” on the top of the stack? Maybe I’m looking for a piece that isn’t even missing? Yes, you’re correct – I think it has a little neck on top and sits on top of the regular cones. 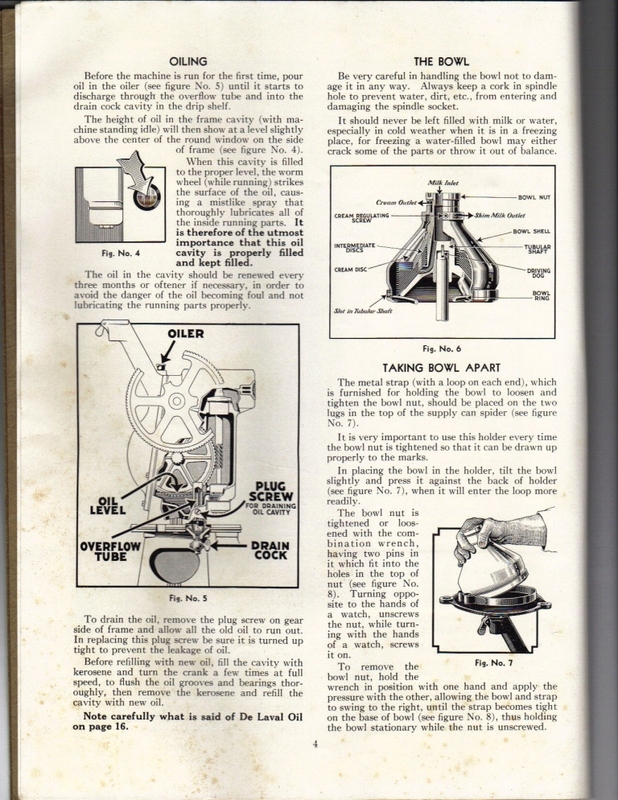 We used this manual and got our DeLaval turning… hooray!!! 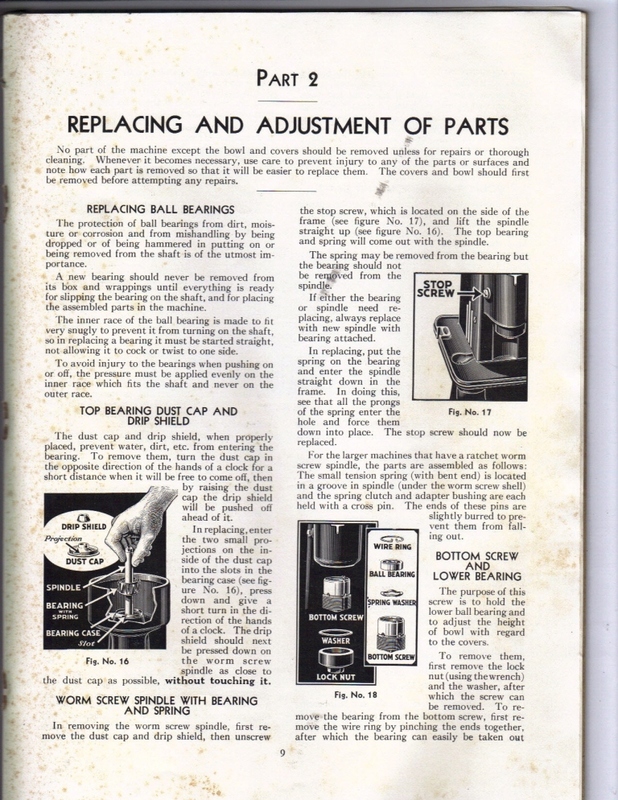 (It was the bearings, but a good cleaning and oiling seams to have worked.) We are still not separating…. I think we have to find a cream disk and bowl ring, but I’m hopeful. Thank you again for sharing the information on here. 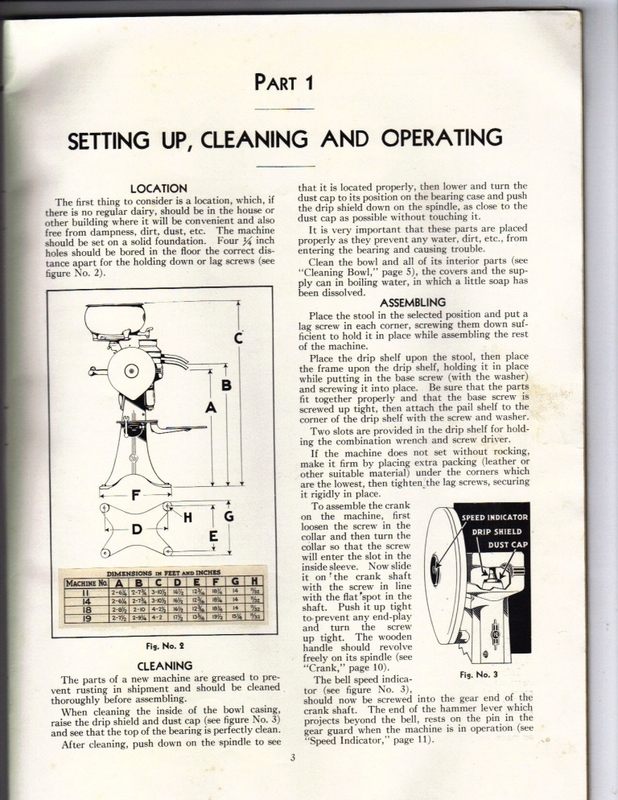 You say you need “a” cream disk – How many disks does your separator have? Most have several disks, not just one. 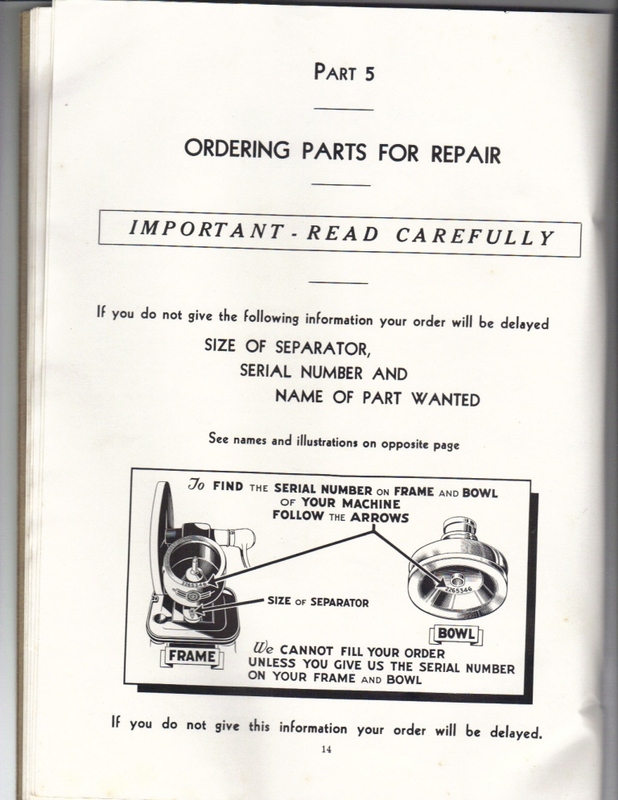 For a bowl ring, I would suggest looking at maybe http://www.partsdeptonline.com and check for other styles of separators that might have similar seals or check a local hardware store, maybe there’s something that will retrofit your machine. Hello. Thank you for putting this manual on here. We just found a DeLaval Separator, #518 and are trying to get it working. I’ve already found that it is missing some important pieces. Maybe someone knows where I could get a cream disk and bowl ring??? (I know it won’t work without them.) Also, what we’re having a problem with is that the worm screw spindle won’t engage and turn… the handle just locks. The handle will turn backwards, but not forwards. Does anyone know what would cause that? Is that a problem with the ball bearings? Thank you… any advice or suggestions would help. It’s a pleasure to meet you, and to find your lovely web page. Thank you! 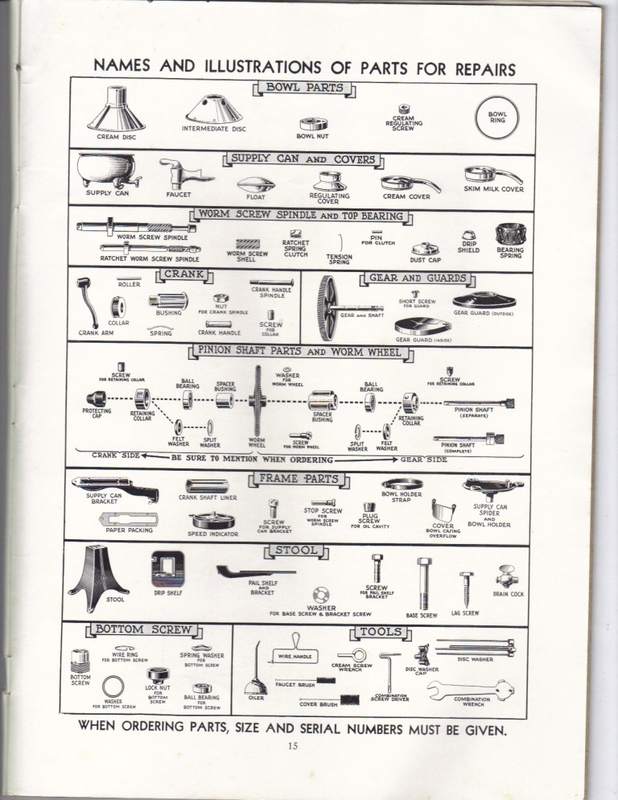 I only have the wrench (a little different from the one found here) and lots of memories. I found a picture of all the components, but couldn’t remember how they went together. What a wonderful thing you’ve done, putting this manual online! 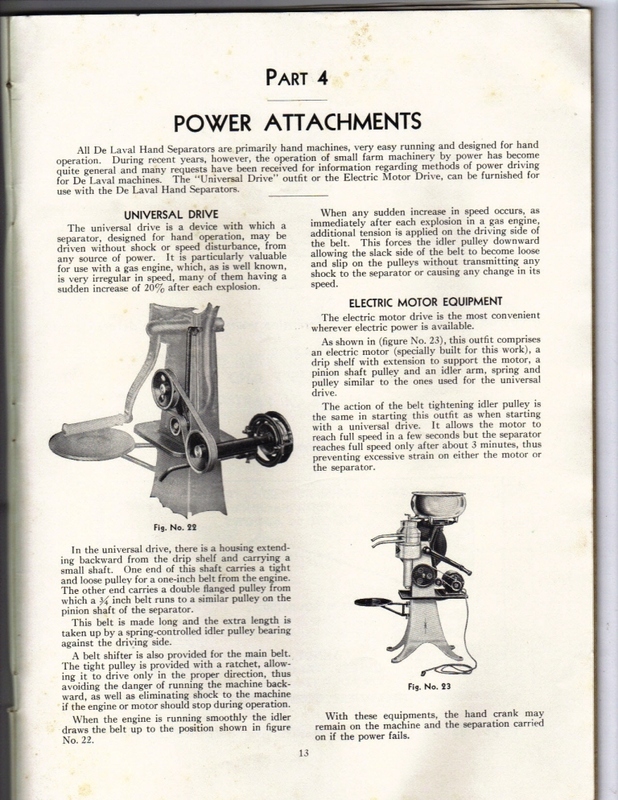 It’s a 1940, the year my folks were married, so this is most surely the manual they had. The one thing I don’t see is the funnel-shaped strainer that sat on top of the bowl. One clamped a new filter disc into the bottom of the strainer each time. I remember that women started making dolls of those filter discs and for a time, one could buy colored filter disc specifically for making those dolls. I have an old strainer like that, I saw an idea where they turned it over and turned it into a lamp shade. 🙂 I have a newer one that is stainless steel that I use for my milk now. Thank you for your memories, I enjoy hearing peoples stories and history! 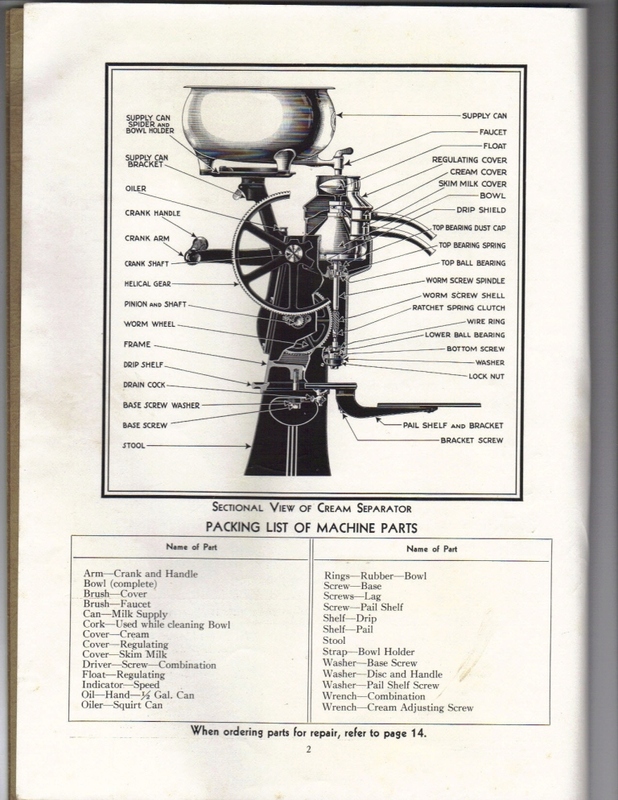 Can you tell me the brand and model of your cream separator? So happy you put this manual on line! 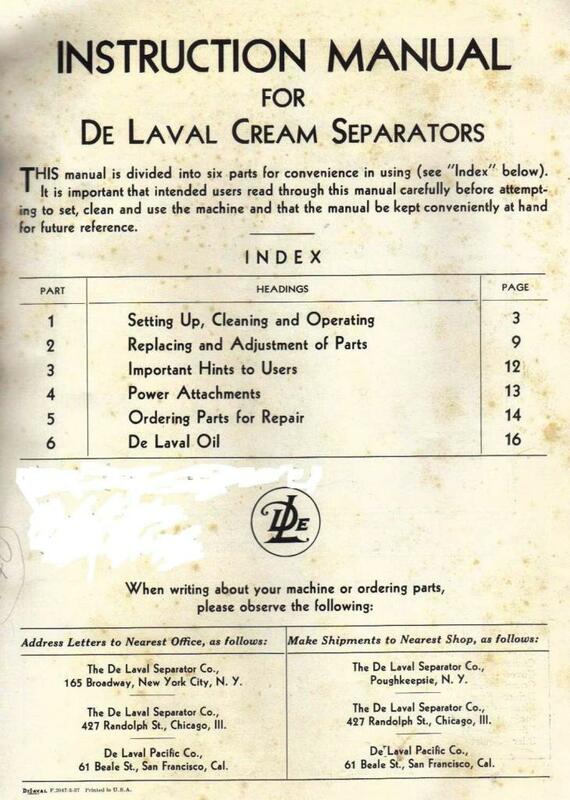 Your website displaying the De Laval Cream Separator Instruction Manual has been a great help to us in working with an undated separator. It is probably from the 1940’s era. 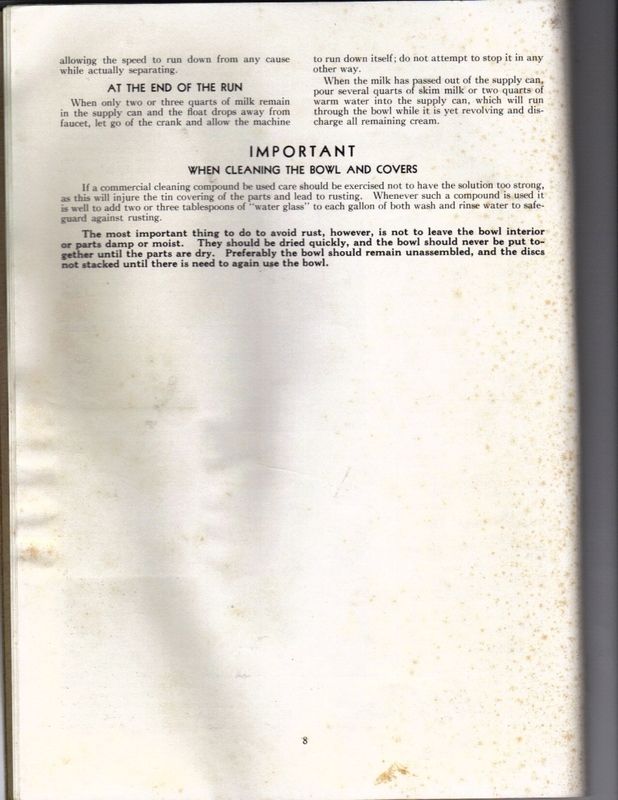 It resembles the Manual pictures very closely. This particular separator came from a farm in South Dakota. It is now owned by the best ice cream store in Illinois. 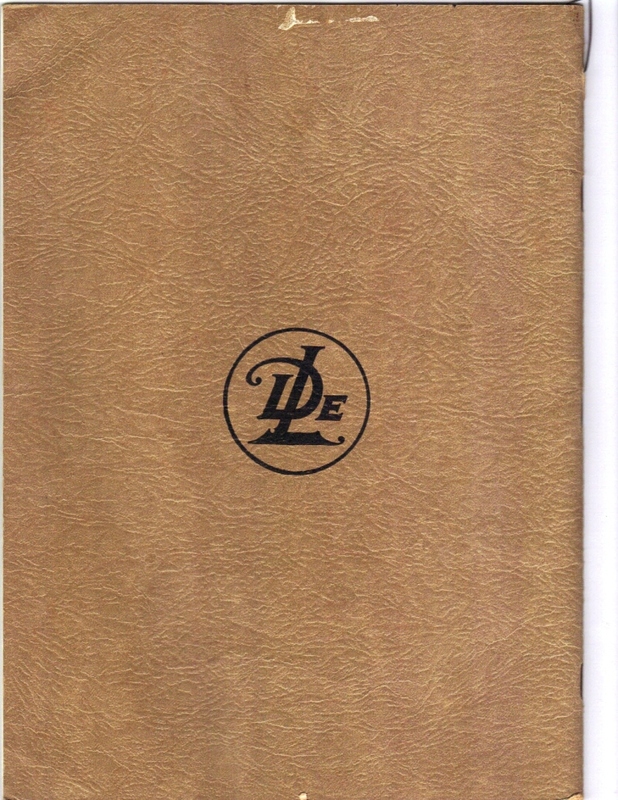 When a kid on a farm in Nebraska, my parents had a De Laval that I cranked hundreds of times. The frequency was twice daily to separate the milk from my dad’s 10 to 15 Holstein cows. I remember listening for the bell while cranking. 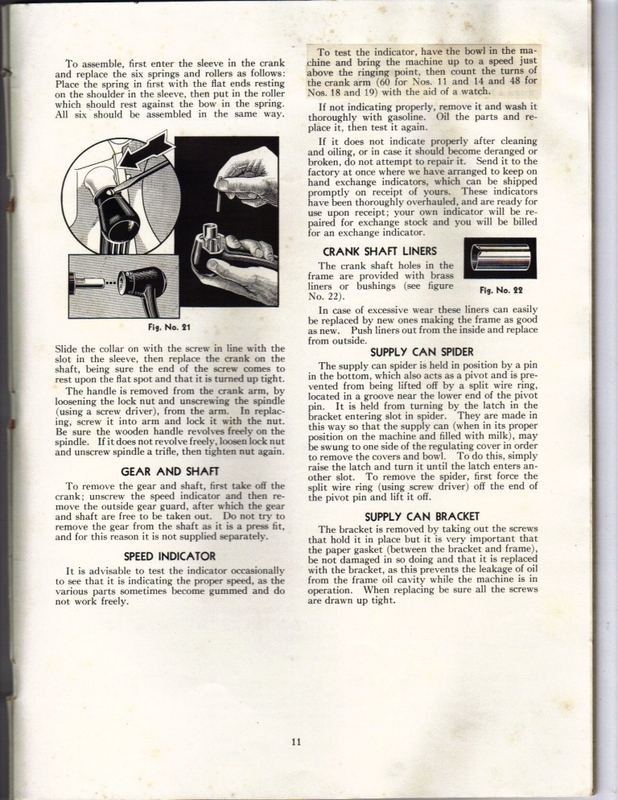 Many thanks for re-producing the manual online. Thank You for displaying this manual. 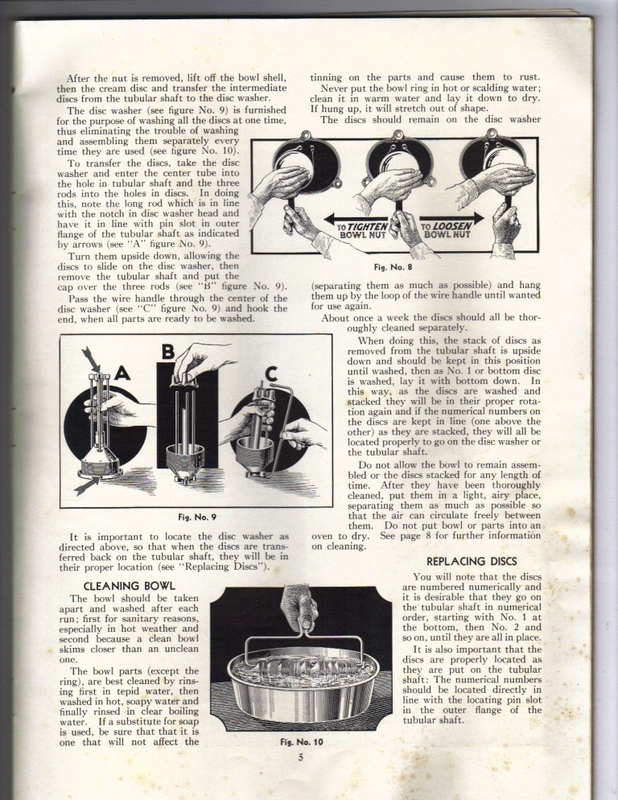 It helped me get my cream separator up and running. A local dairy is licensed to sell fresh whole milk. My four year old twins and all of their cousins had a blast watching it work. Then getting to churn fresh butter and hand cranking homemade ice cream. I don’t know who had more fun them or me! That was my hope! This type of information can be hard to come by, so I’m glad you were able to find us!! From experience, I can tell you my best tip is to keep the milk warm & don’t stop the cones spinning until you’re all done (we would break between to milk cows and it cools the milk and gums up the machine). Last tip is to keep the nut on the top of the cones tight.